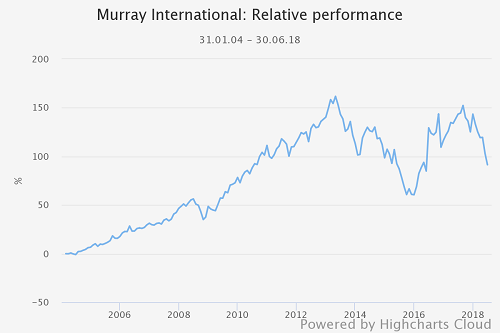 Murray International has become one of the largest investment trusts in the UK since it was set up in 1907. 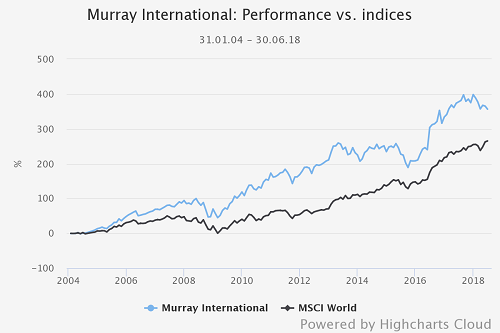 The company aims to achieve a total return greater than its benchmark (a composite index comprising 40% of the FTSE World UK and 60% the FTSE World ex-UK) through investing in equities and fixed-income strategies across the globe. Within this, the manager tries to increase the company’s revenue in order to maintain an above-average dividend yield. 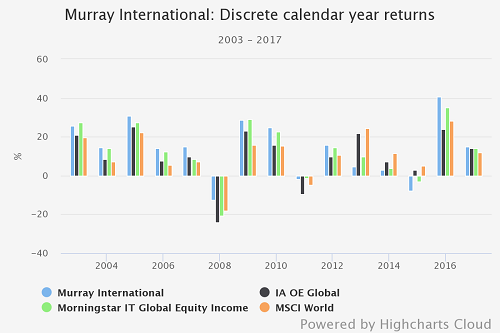 Murray International's management company, Aberdeen Asset Managers, has the view that markets are not always efficient and, therefore, it can generate long-term growth through identifying companies that are undervalued. This is often due to changes in management, business practice or the direction the company is hoping to go in. Since Bruce Stout took over the trust, 14 years ago, it has comfortably outperformed the MSCI World, delivering NAV total returns close to 360%. However, in recent times the trust has struggled to keep up with its peers, and 2018 has seen the trust underperform the MSCI World by a margin of 7.6%. The trust’s strong focus on quality companies and value means it has missed out on much of the liquidity-driven rally which has taken place since quantitative easing began. Given the manager's view on the wisdom of current monetary policy this is not surprising; he most famously described QE as 'economic vandalism'. With this in mind it is worthy of note that the trust has performed admirably during downturns, and in particular in 2008 and 2009, when it managed to avoid much of the decline present at that time and then bounce back to return almost double the growth of the index in the following year. Perhaps reflecting the popularity of Bruce's view, despite the trust's prolonged period in 'the wilderness', demand for its shares remains strong and it has rarely traded at a discount to NAV and the trust currently trades on a small premium. The £1.5bn trust invests in a fairly concentrated global portfolio of 50 large and mega cap equities (37% and 54% respectively) and 28 fixed income holdings. This figure has increased dramatically since we last covered the trust, showing the manager's increasingly pessimistic outlook. The manager uses bonds instead of cash because he prefers to remain fully invested even if he wishes to take money off the table. Relative to the MSCI World, the trust's largest overweights are towards communication services (+13.47%), consumer defensives (8.79%) and basic materials (6.28%). In absolute terms, consumer defensive and communication services dominate the the portfolio. In regional terms the trust is very underweight toward the US, with just 18% of the portfolio invested Stateside – a much lower exposure than most comparable trusts. 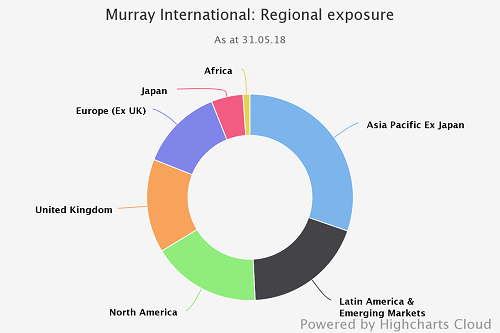 Murray International is heavily exposed to Latin America, where almost 20% of the portfolio is held, compared to a fractional weighting in the benchmark. In Europe the trust has no major divergence from the index weighting, but exposure to the UK has increased over the past few years and now sits 16% greater than the MSCI World average. The developed Asia markets are another area that the trust is overweight, with 16% of the portfolio invested in the region. The portfolio is managed with a ‘quality’ bias and a focus on valuations – characteristics that have counted against it in recent years as the liquidity-driven tide has lifted stocks across the board, with the cheapest, lowest quality stocks at the forefront in many cases. The manager invests in companies that pass through Aberdeen Asset Managers’ quality screens and meet stringent valuation criteria, with a bottom-up approach that aims to uncover companies with strong balance sheets, transparency of earnings and a demonstrable commitment to shareholder value. The trust will only invest in stocks that are on Aberdeen Asset Managers’ regional buy-lists, put together by teams on the ground that work for the group, giving it a universe of around 330 stocks to choose from. The trust uses gearing on a structural basis, and is generally geared anywhere up to 20%, though it may gear up to 30% if the manager feels the time is right to do so. The trust is currently geared at 12%, the same level that has been seen for most of 2018. On 1 June 2018, it was announced that the company had agreed a new £60m loan facility with the Royal Bank of Scotland (RBS), which was drawn in full on 31 May 2018 and fixed for five years at an all-in rate of 2.328 %. The new facility has been used to repay a maturing £60m loan with RBS. In the ten years to the start of 2013 the trust was ahead of its benchmark and the sector by a long margin, but the last five years have destroyed that lead entirely. 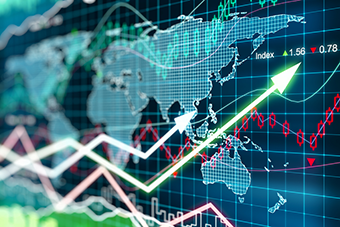 Discrete performance data shows the trust has previously been able to outperform the MSCI World index by a significant margin during positive and negative markets. In 2005-7, when the index was delivering positive returns, the trust outperformed strongly. In 2008, when the index fell sharply, the trust pared losses, and then in the following two years the trust outperformed the index on the upside again. Bruce remains firmly convinced that the pain is worthwhile. He is ardent in his criticism of monetary easing. In the most recent annual report, he wrote that while central bankers were "cocooned in the economic theory of how the world should work, scant attention was paid to how it actually does". He goes on to mention that he is extremely cautious in this current environment because the unorthodox monetary policies determined by central banks have been the drivers of relentlessly rising financial markets. Now that these actions have been exhausted, we are left in a "festering cauldron into which feuding politics and narrow-minded protectionism are becoming increasingly prevalent in the new world disorder". The trust aims to provide both capital and income growth. To that end the board has the aim of providing a progressive dividend. In this it has been largely successful, delivering increasing dividends for the past five years at a rate of 4.1%. 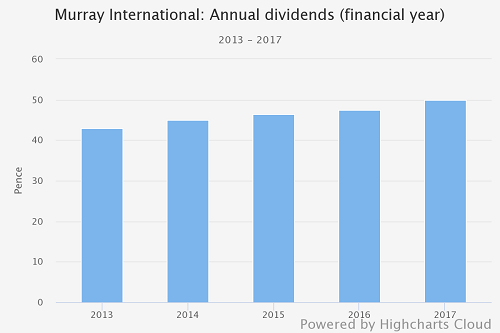 With a net dividend yield of 4.4% Murray International offers the second highest yield in the global equity income sector. The board has so far increased the first dividend for the 2018 financial year to 11.5p, from 11p and representing an increase of 4.5%. As of the most recent annual report, revenue reserve cover for the trust stands at 0.57x. Aberdeen Asset Managers (as at 21 December 2017) has c.£655bn assets under management. Bruce Stout has been the named manager on the trust since 2004. 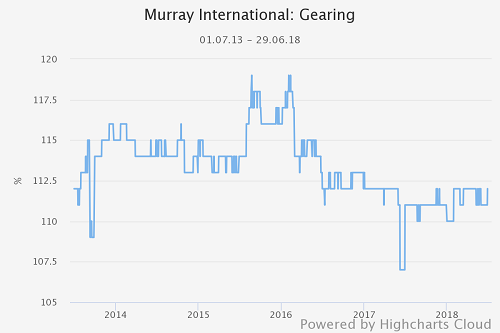 He is something of a household name among investors, in part because of the trust’s outstanding long-term track record but not least because of his vocal distrust of the market’s return to form since 2008. Bruce joined Aberdeen Asset Managers in 1987, and has been involved predominantly in the emerging markets teams. The management company has its headquarters in Edinburgh and invests globally, operating from over 60 offices around the world. Clearly, though, Bruce is not a one-man band and the show does not depend on him alone to go on. Funds are managed on a team basis as there are no 'star' fund managers in Aberdeen Asset Managers: investment managers do their own research and analysis, and all ideas are shared via formal committees and common databases. Consistency is implemented across the group’s offices worldwide by the investment committee, led by the chief investment officer. Despite its poor recent performance, the trust continues to trade at a premium. This has been the case, albeit now with a slightly narrowed premium, more or less since demand for the trust soared after its deft handling of the 2008 crisis. The board continues to have a strict control policy to seek to address temporary imbalances of supply and demand. So far in 2018, no shares have been purchased for the treasury or cancellation, but 357,665 shares have been issued from the treasury. This was also the case in 2017, where 301,642 shares were issued from the treasury. 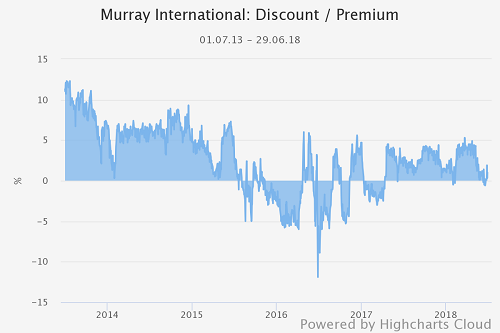 During the past year (to the end of June) the shares have traded at an average premium of 2.5%, reaching highs of c.5% and lows of c.-1%. 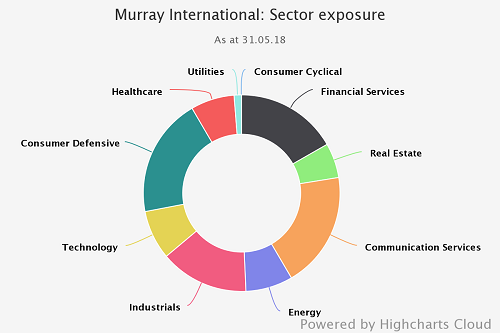 Being one of the biggest trusts in the investment universe, Murray International benefits from significant economies of scale. The OCF currently sits at 0.64%, down 0.04% from in 2016. This is substantially lower than the Equity Income sector average of 0.75%. The trust also has a tiered performance fee, that starts at 0.575% of net assets up to £1.2bn, 0.5% for £1.2bn – £1.4bn and 0.425% thereafter.